A graving dock at General Dynamics National Steel and Shipbuilding Company (GD-NASSCO) flooded on July 11, floating an under-construction Expeditionary Sea Base ship off its docking blocks and allowing the ship to take on water. The future Miguel Keith (ESB-5) was in a graving dock at the San Diego ship construction yard when, according to local media, a barrier that holds that seawater collapsed. “The ship floated off the docking blocks and took on water through hull cuts that were made to support the ship’s construction and outfitting,” Naval Sea Systems Command spokeswoman Colleen O’Rourke told USNI News. 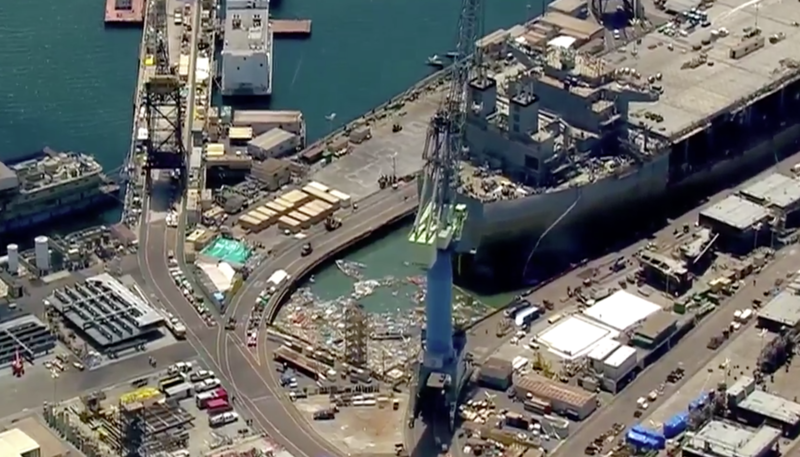 Aerial footage from San Diego television stations show significant debris and water in the drydock, which workers are trying to clear. Miguel Keith will be the Navy’s third Expeditionary Sea Base ship, and the fifth auxiliary overall delivered by NASSCO based on the Alaska-class oil tanker design. The ESB ships basically scoop out the middle of the oil tanker design, leaving that massive open space to support a mission bay below – to operate small boats and unmanned vehicles for special operations and mine countermeasures – as well as helicopters on a flight deck above. NASSCO laid the keel for Miguel Keith in January. The ship is named after Miguel Keith, a Marine and Medal of Honor recipient from the Vietnam War era. The first ESB, USS Lewis B. Puller (ESB-3), was commissioned a warship last summer when it arrived in U.S. 5th Fleet, where it continues to serve today. The second ESB, USNS Woody Williams (T-ESB-4), arrived at Naval Station Norfolk earlier this month after departing San Diego.